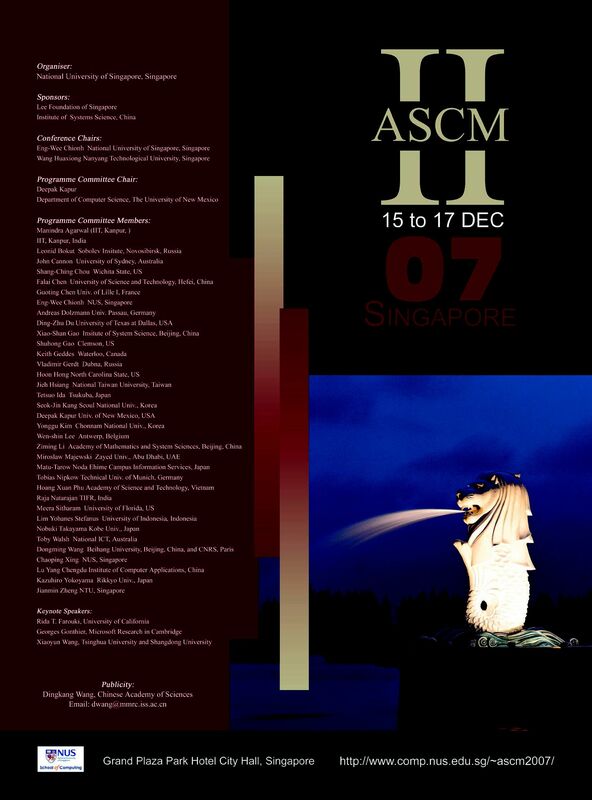 The conference organizers warmly invite your support of ASCM 2007. Corporate support publicizes your organization's interest and commitment to the computer/mathematics field. An event with international visibility, ASCM 2007 is the perfect place to inform leaders and students in the field, as well as the interested general public, about your company's activities and products. LEE FOUNDATION OF SINGAPORE, 65 Chulia Street, #44-01 OCBC Centre, S049513. Lee Kong Chian. Assisting students to broaden their education through exposure to innovative ideas and technologies. INSTITUTE OF SYSTEM SCIENCE, CHINA. Established in October 1979, the Institute of System Science of Chinese Academy of Sciences, is engaged in basic research in systems science, mathematics and interdisciplinary subjects related to system science as well as application oriented basic research. those of investment holding companies.